Gertrude Jeckyll. A fine David Austin Rose. Two weeks! It’s going to take that long just to break the news to each of the roses. “Madame Isaac Pierre, we have to move, can you pull up all your roots in two weeks?” Madame Isaac isn’t going to be happy to hear that one. And I can’t even imagine what Madame Pierre Oger is going to say. After all she is the one with her own private bed in the middle of the brick courtyard. And now I have to tell her she’ll have to share a bed with her sister, Reine Victoria. This isn’t going to be pretty. “Two weeks is out the question” I bravely say. “Okay, well as soon as you can then.” Wow, that was easy. “Pam, we’re moving ASAP.” After the explosion dies down we hit the ground running. Or should I say shoveling. I knew this was coming so I kept a lot of rose in pots. The last four month’s purchases from Limberlost and Heirloom are still in five gallon containers. So far so good. Then I gaze towards the beds in the backyard. At the OGRs in the ground. And I curse the day back in December when I decided I was not going to prune my OGRs back in length and height. I want the full affect of a giant Bourbon in full bloom. Now it was going to take a bottle of the stuff to calm my beating heart at the prospect of tearing them up at the moment they are starting to bud. I don’t mean a couple of buds like an awakening Hybrid Tea. 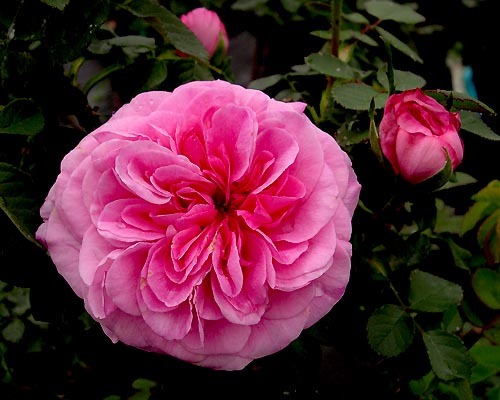 I’m talking hundreds of buds; the kind you get on a fully pegged Mme Laurol de Barney in spring. This isn’t the worst part though. The worst part is this is the second year for my plants which means it’s the first year I’ll see them in all their glory. Miss it. No way! Plan B from Tommy. “Dig them up and put them in pots. “ Bingo! I like this idea. I move the plants, they don’t go through a lot of shock and I don’t miss the spring bloom. Quickly promising Tommy the first offspring of my Souvenir de la Malmaison I spring into action. Bob Edberg graciously offers to lend me enough pots to make the move. Being an OGR person he doesn’t even ask why I want to spend my spring mornings digging up a ten foot Hybrid Perpetual. Pots and potting soil in backyard I begin to dig, and dig, and dig, and dig. These plants may only be one year old but no one told me about this root system. All that composting I did means there is plenty of loose dirt for the roots to grow through. And they did. Madame Pierre Oger is first. With 10’ canes she is the largest. I carefully cut out a circle around the root zone with a long shovel. Then, taking two shovels, one on either side of the plant I gently tip her out of the hole on her side. No large ripping sounds, so far so good. I put enough potting soil in the bottom of her new 15 gallon home so she’ll sit at the proper level in it and gently ease her into the pot. One problem. In my vigor to save as much root system as possible I forget the pot has a fixed diameter. Cursing my stupidity I gently begin to shear roots and dirt off the side until she fits. She eases in. I cover her with mulch and start pouring on the B-1. Four hours later I go back out and notice drooping at the ends. More B-1. Heart pounding I go to bed that night with visions of awakening to a completely limp Madame Pierre Oger. The next morning at first light I’m up. Pam looks at me like I’m nuts as I dress quietly. “Where are you going?” “To check on Madame Pierre.” Being the understanding woman she is Pam sighs and goes right back to sleep. Oh, the solitary life of the rosarian. I tiptoe down the stairs into the backyard, heart in hand. Turning the corner I am greeted by Madame Pierre Oger fully awake and standing proudly in her new potted home. Success! This will work. After sacrificing an Azalea in Tommy’s name I get to work. The other roses rapidly follow. Souvenir du Dr. Jamain, Ruhn Von Steinfurth, Comte de Chambord, Paul Neyron; up they come. And live. Everyone darn one of them. Now drunk with success I begin digging up perennials. The lavender, the foxgloves. Make me move, huh? Fine, I’ll show them what moving is. Two weeks later I exhaustedly pull up the last rose, Brother Cadfeld. Then I notice standing in a corner is Gertrude Jeckyll. I wasn’t going to take her but before you jump on me let me explain. I bought Gertrude a year ago bareroot. Planted her and she grew and grew. But never bloomed. Not once. Not one little bloom. I thought fine, then you can stay here. Walking over to her to take one last look what do I see? You guessed it. A little bud. Not much of one, but a bud just the same. What can I do? How do you abandon a rose pleading to be taken along. Up she comes and into the pot. But being in a corner I can’t get the leverage I need to get a big root ball. She goes into shock. Break out the B-1 and start feeding her. I arrest the shock but not until she’s dropped almost all her leaves and, you guessed it, all the buds. I tell you one thing this better be one great rose. Looking around the devastation of what was once a lovely backyard I’m at least cheered by the sight of all my old friends standing tall in their pots. Real troopers. Now all we have to do is move them. Easy, I’ll rent a huge truck with a ramp and an appliance dolly. Wheel them up the ramp, into the truck and off we go to the new place. Two friends are enlisted in the endeavor. Saturday morning at 8 AM they show up. By 8:10 AM they’ve learned all about OGRs, how big they get and why they can’t be cut back. Needless to say they are thrilled. Three truckloads and as many trips later we unload the last rose. A 11’ Graham Thomas in the huge pot it’s been growing in over the last year. By now tired, scratched and profusely thanked my friends go home But before they leave they are drawn into the backyard by an alluring aroma. There, greeting us in the midst of chaos is something sure to warm rosarian and non-rosarian alike. The sight and scent of a single bloom of Madame Isaac Pierre. You see, she opened her first blossom that morning while we were moving her. Gertrude? She has buds again.